We’ve been in Staniel Cay for nine days. The weather is still too windy to snorkel and there isn’t much to do ashore. 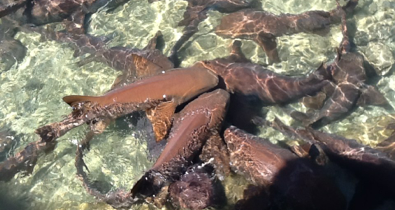 Nurse sharks are very common and harmless here. Above are a few waiting at the marina, next to the fish cleaning area. We enjoyed the company of friends on Interlude and Southerly II until they left a few days ago. They are now in Georgetown. Many of the cruisers who come to the Exumas eventually end up in Georgetown. It’s a large area, room for hundreds of boats to anchor, has a great grocery store, a laundry, free water, and lots of on shore activities. The height of the season is Regatta Week which is at the end of February. We’ll probably go there then and continue south to Long Island. In the meantime, as soon as the wind drops we will probably go back up to the areas we passed last week to snorkel and hike the trails. We have been waiting for a package to arrive from the States with our air card, 12V computer charger and mail. It came on Watermakers Air today. It was so simple to get the package here via Watermakers. They took care of customs, which was $20.66 for the two items. There was a $35 fee to ship it. I think the $35 is the minimum charge and our package only weighed 2 lbs, so we could have sent a lot more. We also learned that you can have mail sent for free on the Watermakers plane. You have an envelope with mail in it sent to their office in Ft. Lauderdale and have it marked for Staniel Cay. There is no extra charge to get it here. Their plane comes every day usually with passengers so they put in the mail as room allows. You can also send mail from here to the States on Watermakers. You just put a US stamp on it, bring it into their office at Staniel Cay and they’ll fly it back and put it in their outgoing mail in Ft. Lauderdale. Unfortunately Batelco isn’t open on Saturday, so on Monday we’ll take the air card and computer to their office in town. They’ll put a sim card in the air card and then we’ll pay for a month of data on their network. We heard it is slow for data, but we aren’t used to fast, so as long as it is reliable we are happy. This week we used the Exuma Wifi Network and had 1.5 GB to use in seven days. We only used half of that and today is the last day, so we have two hours to use up what is left. I think I’ll just upload some photos and that should use it up fast. Click here for some more photos of Staniel Cay.